Perfecting Satin sheath gown features a sheer bateau front neckline that gently frames the satin sweetheart front neckline with beadwork and embroidery. 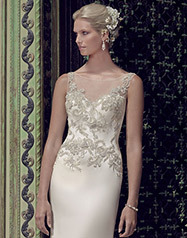 The "V" back neckline is sheer with beading and embroidery. Matching satin buttons trail the entire back of this gown.